Syracuse Northeast Community Center (SNCC) purchased a vacant lot, adjacent to their existing property, in 2013 with the intention of transitioning the space that would bring residents of the Northside catchment area together. 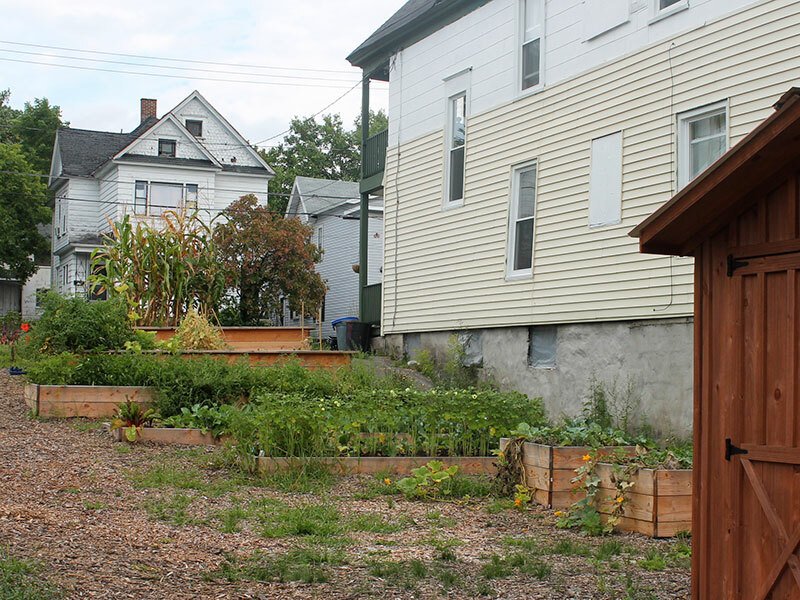 In the fall of 2014, SNCC initiated a relationship with Syracuse Grows to discuss the development of a community garden in the lot. SG agreed to collaborate with SNCC, by providing guidance on community garden development, connecting SNCC to existing community resources for the garden, and offering to provide material support for the garden during the annual Resource Drive. The partnership also led to collaboration with the Landscape Architecture program at SUNY College of Environmental Science and Forestry for assistance in developing a sustainable, practical, and aesthetically pleasing design for the space. Although the garden is being directed through SNCC, the goal has always been that it becomes a true community-based project led by neighborhood members and program participants. The garden has provided great opportunities for cross-cultural and inter-generational programming and activity. 10 beds were planted and utilized over three seasons. Participants in the space included a Dr. Weeks fifth grade enrichment class, participants in Catholic Charities’ teen program, twenty members of SNCC’s senior club programming, the Northeast Girl Scout troop, and over thirty volunteers throughout the growing season (most notably at the initial garden build in collaboration with Syracuse Grows’ Resource Drive on April 18, 2015). Senior citizens and teens have participated in planting and tending to the garden beds, the Catholic Charities Pre-K class on SNCC’s site learned about composting and composted daily throughout the summer, and the produce grown was used in our programming and distributed in our emergency food pantry. In the last year, the garden yielded, corn, lettuce, tomatoes, zucchini, ocra, peas, and beans. The community garden not only provided an outdoor space for SNCC programming, where neighborhood youth, seniors, and families will develop a strong bond, but it assisted these same populations in cultivating their own skills and interests while growing healthy food. Volunteers have worked sporadically over the last year and continue to approach SNCC for opportunities through the Volunteer & Community Engagement Coordinator, Lexie Kwiek. The hope is for more community supported beds next year, in addition to the programmatic beds that were operational throughout 2015! Please contact garden coordinators Michael Collins (mcollins@snccsyr.org or 315-472-6343) or Russell Nylen (rnylen@syr.edu or 386-748-9489) to find out how to get involved with this garden.